Stainless steel case with a black leather strap. Fixed stainless steel bezel. Black dial with silver-toned hands and index hour markers. Roman numerals mark the 3, 6, 9 and 12 o’clock positions. Minute markers around an inner ring. Dial Type: Analog. Luminescent hands and markers. Date display at the 3 o’clock position. Chronograph-three sub-dials displaying: 60 seconds, 30 minute and 6-hour totalizer. Automatic movement with a 46-hour power reserve. Scratch resistant sapphire crystal. Pull/push crown. Skeleton case back. Case diameter: 44 mm. Case thickness: 15.18 mm. Round case shape. Deployment clasp. Water resistant at 50 meters / 165 feet. Functions: chronograph, date, hour, minute, second. Luxury watch style. 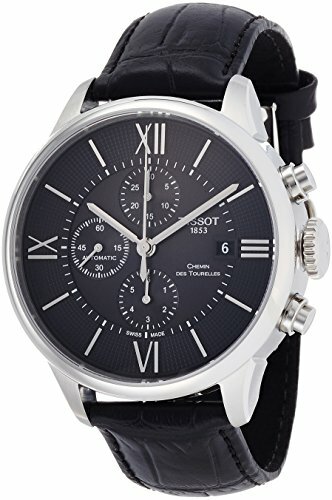 Tissot T-Classic Chemin Des Tourelles Black Dial Chronograph Mens Watch T0994271605800.Stainless steel case with a black leather strap. Fixed stainless steel bezel. Black dial with silver-toned hands and index hour markers. Roman numerals mark the 3, 6, 9 and 12 o’clock positions. The Tissot® T-Touch Expert Solar watch embodies the company’s pioneering spirit as it is a true first: a touch-screen watch powered by solar energy. Anti-magnetic titanium case with black PVD coating. Fold-over clasp closure with a dual push-button release. Two-hand analog display with ETA E84.301 Swiss quartz solar tactile movement, and touchscreen digital display. Chronograph functionality (EOL, meteo, altimeter, altitude difference meter, compass, regatta, countdown timer, chrono split and lap (logbook), 2 alarms, backlight, second-time-zone, perpetual calendar with day and week indicator, accumulator charge indicator). Textured black dial face features Arabic and sticks indexes with a minute track at dial perimeter. Bezel features compass markings and numeric detail. Some watches don’t have an easy time of it. On one hand they have vital functions to perform while retaining a characteristic allure on the other. Many watches find it hard to rise to this often a somewhat contradictory challenge. Not the case with the redesigned Ternos Professional TT from Davosa. 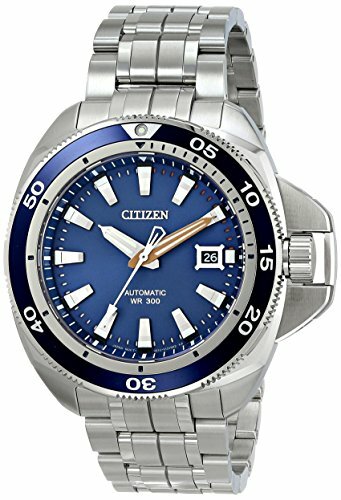 This timepiece is a consummate professional and easily accompanies the wearer down to depths of up to 500 meters. And after punctually resurfacing, it makes a truly eye-catching statement on the wrist.